Irresistible cottage-style playhouse on stilts! This adventurous and exciting playhouse is a great hideout and allows for a sheltered play area to be built underneath the tower. Ideal for maximising garden play space! 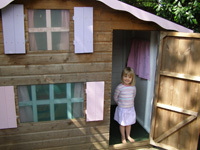 The Tower playhouse, based upon the popular Poppy playhouse, will provide hours of fun and amusement for your children. This unusual model includes a 4'11" x 4'11" Poppy playhouse (also available without tower) mounted on to a raised platform complete with 1'11" deep verandah with ladder. Built to exceptional safety standards to meet European Toy Standard EN71, Honeypot playhouses are constructed with an attention to detail and their natural look will enhance your garden, while giving pleasure to your children or grandchildren. The building is T&G clad and the roof and floor are constructed using OSB (resin bonded board). Glazing is safety Styrene and the door is 2' x 3'7" (0.6x1.08m) in size. Please note, the 6'8" depth includes the verandah. Self-assembly by customer (instructions supplied). For safety, it is recommended that children use this or any raised play structure under adult supervision at all times. 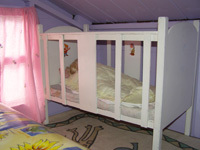 The playhouse includes side ladder and verandah with safety balcony. 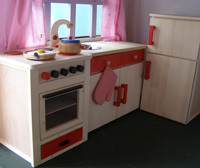 All our playhouses meet European toy safety standards (EN71). Coloured wood comes ready tinted.